BendPak Super-Duty Truck Lift XPR-12CL 2-Post 12,000 Lb. Cap. Others might charge extra for these necessary adapters, but they're standard with every XPR-Series heavy-duty model. Every XPR-12CL two-post lift is designed to keep your floor clean. Our Clearfloor design offers enough space for cars and trucks up to 12,000 lbs. Pure Direct-Drive performance is matched by, cutting-edge technology, top-of-the-line materials and a design that's ahead of its time. Fits in shops with ceilings higher than 14'. 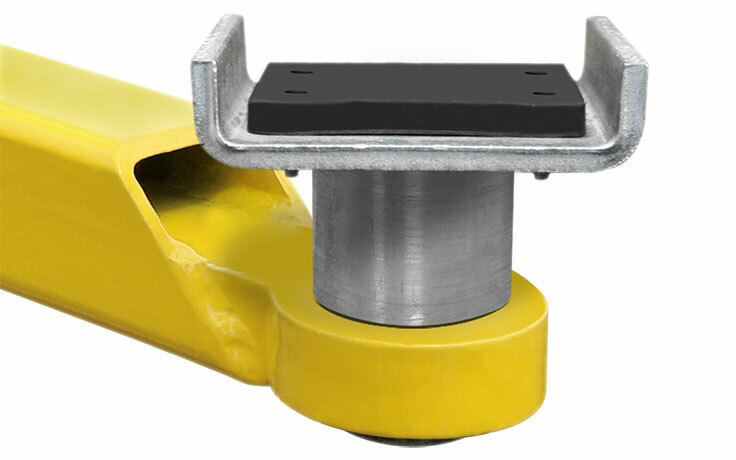 Our XPR-12CL two-post lift offers a wide selection of durable, safe and reliable systems for virtually every lifting application. This is an incredibly rapid lift with robust menus of features to increase efficiency and productivity. They never overwhelm you with serviceable parts and constant maintenance, and as a result, you get lower operating expenses and higher productivity. 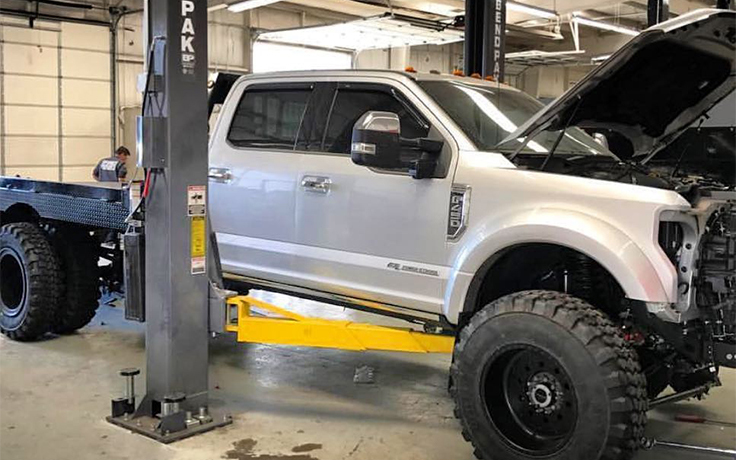 If you're looking to make more money in less time than ever before, you'll find that this car lift is the perfect addition to your shop—especially when you work with bulkier, heavier vehicles that require heavy-duty lifting capacities. But just because these super-duty models were designed for the big stuff, it doesn't mean they can't handle light-duty work as well. The XPR-12CL two-post lift can easily raise your largest full-sized pickups and commercial vehicles, yet they still provide specific capability for sport and compact cars, both foreign and domestic. The 12K capacity features full-reach arms that collapse to standard lengths and lower-seating lift pads that clutch standard passenger automobiles. The columns are also placed wider for trucks with fixed towing mirrors, and the overhead equalization beam is up and out of the way for those "high-cube" delivery vehicles. When it comes to ease-of-use, our dual-synchro equalization system and user-friendly controls are legendary. When you buy BendPak, you can expect a significant boost in performance and lift operation life expectancy because your lift is built to be the last one you ever purchase. No one surpasses us in quality and safety. That’s why when you get one of our lifts, you get more than just a great product. You get peace of mind. That’s the benefit of owning a BendPak. Despite the higher lift capacity, the XPR-12CL makes it just as easy to get under your low-profile. This is because the two-post lift arms are designed to be versatile with virtually all vehicle types. Others might charge extra for these necessary adapters, but they're standard with every XPR-12CL. 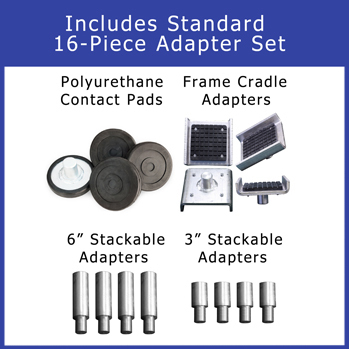 The multi-piece set includes four, 6" stackable adapters; four, 3" stackable adapters; four polyurethane contact pads; and four frame cradle pads. It’s ideal for trucks and vans with running boards or auxiliary fuel tanks. 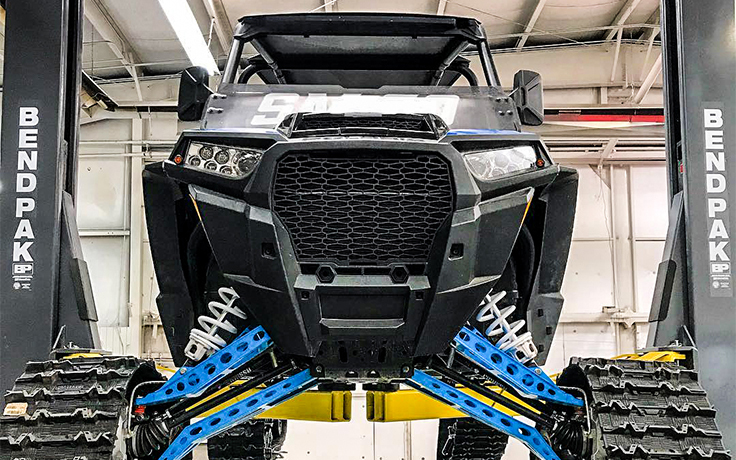 A heavy-duty two-post lift has different dimensions than our smaller lifts, which means our design needs to ensure that all vehicle frames, especially the frames of low-hanging doors, have sufficient clearance to open their doors while the lift is in operation. 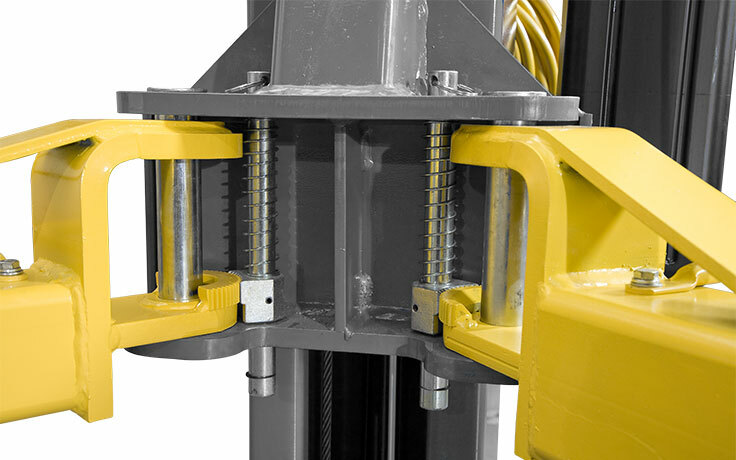 We build our lift columns tall in order to reduce the load stress placed on each column. With a 53” column height, which is taller than many of our competitors, BendPak remains the more durable option for your garage. Combined 12,000-lb. capacity columns are each made out of a single piece of steel, so each piece stays stronger and lasts longer. 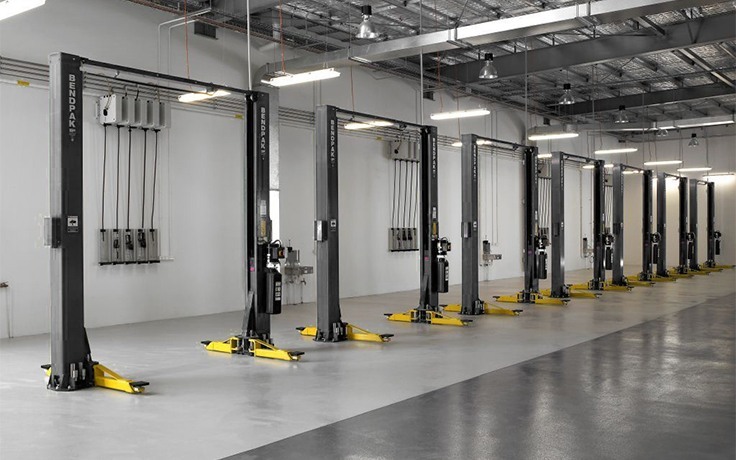 In order to maintain a safe garage environment, every XPR-12CL two-post lift comes with our dual-synchro equalization system. This keeps the lifting mechanics equal on both sides of the lift at all times. Free-flow, high-pressure 3/8" hydraulic lines, a high-flow pump and integrated AC power-unit increase ascent and descent speeds for enhanced productivity. The safe and rugged XPR-12C-192 two-post lift features extended height columns for added overhead clearance, as well as an adjustable top beam to accommodate wide or narrow installation setups. on equipment structure, to be free of defects in material and workmanship. Power units, hydraulic cylinders, and all other assembly components such as turnplates, slip plates, cables, chains, valves, switches etc. are warranted for one year against defects in material or workmanship under normal use. BendPak Inc. shall repair or replace at their option for the warranty period those parts returned to the factory freight prepaid which prove upon inspection to be defective. BendPak Inc. will pay labor costs for the first 12 months only on parts returned as previously described. 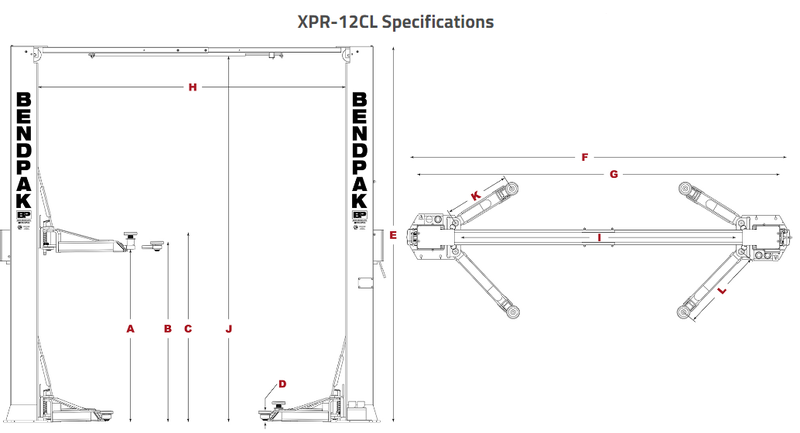 Click the button below to add the BendPak Super-Duty Truck Lift XPR-12CL 2-Post 12,000 Lb. Cap. to your wish list.